Below you will see a Google Calendar with events from all participating astronomy organization in Wisconsin. You can filter which organization calendar overlays you wish to see by using the down arrow icon on the upper-right of the calendar graphic. Wisconsin Astronomy maintains their own calendar overlay to add events that we think Wisconsin stargazers would want to know about, but that are not part of an organization’s own Google Calendar. Remember that stargazing events are outdoors, and in Wisconsin that often means it's going to be a little chilly. Even during the summer time, temperatures at night drop a fair amount and after a day of mid-70's a night time temp of 60 will seem very cool. Dress in at least one extra layer -- you can always remove excess clothing if you're too warm, but you can't put it on if you didn't bring it. 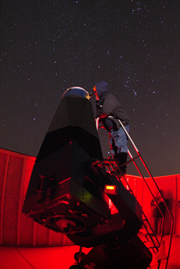 One extra tidbit: observatories are not heated, because the warm air would churn while mixing with the colder outside air and blur the views through the telescope. So just because an observatory may have a domed roof doesn't mean it'll be warm inside.